Some people might not describe their stretch marks as beautiful, but these women are proving that they can be turned into gorgeous works of art. 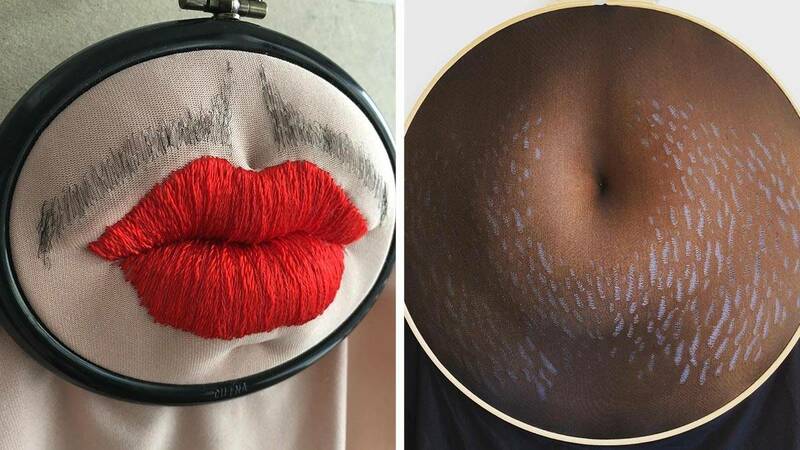 Sara Shakeel added glitter to stretch marks in a beautiful display of empowering art, Cinta Tort Cartró turned stretch marks into beautiful rainbows, and now artist Sally Hewett has incorporated them into her amazing embroidery. Hewett's art not only focuses on stretch marks, but it also includes surgical scars, discoloration, body hair, cellulite, and so much more. She uses embroidery thread, padding, foam, fabric, quilting hoops, and even real human hair to create the body parts and characteristics, and the results are insanely realistic and three-dimensional. "It is not the conventionally beautiful bodies that take my eye," Hewett says in a statement on her website. "It is bodies which show their history, that have been altered by their experiences, that are decorated with bruises, scars, spots, stretch marks, freckles, pigmentation, veins." Hewett is currently focusing on medical and surgical pieces, where she shows bodies that have undergone changes from disease or surgery. "My granny (an upholsterer and seamstress of great skill) had her breast removed as a result of cancer and was hugely grateful to the surgeon for saving her life," Hewett says on her website. "But she was almost equally appreciative of what a beautiful stitching job he had done. She was very proud of her scar."